The area on which Flaine was to be built, situated in the Giffre mountains, was discovered by two accomplished ski mountaineers from Geneva. Réne Martens and Gérard Chervas knew the mountains around Geneva like the back of their hands. The hard climbs on touring skis were rewarded with fantastic views of Mont Blanc and the surrounding peaks. In 1954 the Swiss skiers discovered the perfect site for a ski station but lacked the money to develop it. The local communities were not interested. The mayor of Arâches, Jean Moret, where most of the terrain was to be found could not help as the village was already up to its eyes in debt building a cable car. In 1959 Martens, a yogurt manufacturer, had the fortune to mention his plans to a certain Dr Boissonnas in Geneva. Boissonnas remembered he had a distant cousin in Paris, Rémi, who was a banker. At the same time Rémi and his brother Éric Boissonnas? were looking for a site somewhere in France to urbanise based on the ideas and architecture they had seen in the United States. Remi was the director of the Banque de l'Union Parisienne. His personal fortune was some 200 million Francs (around 150 Million Euros in 2003 prices) and his brother, Éric had other capital. He was allied to protestant bankers by his mother, Geneviéve Mirabaud and through his wife Sylvie Schlumberger. He'd been in the 'States, an engineer of Geophysics by training he'd actually been looking after the affairs of the Bank Neuflize, Mallet et Schlumberger. His stay in the US had given him a taste for the Anglo-Saxon way of doing things. He toyed with the idea about building a university along the American model - a French Carnegie-Mellon. Remi and Éric were good climbers and loved the mountains although they were less accomplished skiers. In contact with the two Swiss men, Eric visited Flaine at the start of 1959 and began to envisage the construction of a ski station in the mountains. This would be no simple project of urbanism but a masterpiece drawing the most talented architects and artists of the day. Éric was aristocratic but timid he didn't take well to the rough Savoyard manners of the government official Maurice Michaud? with whom all French ski promoters had to work. Michaud imprudently called Boissonnas "a poet suffering from having 40 billion Francs" in an interview with L'Express in 1967. Pierre Dumas, the Secretary of State for Tourism forced him to apologize to Boissonnas. This set the stage for a bitter relationship between the two men. For Michaud, Flaine was one long series of errors. In a report he prepared in 1969 he didn't mince his words calling the development "an anarchy... with buildings placed wherever the developer could buy land... even in the middle of ski pistes". Before visiting Flaine, the Boissonnas brothers were shown the Belleville valley, site of the future station of les Menuires. They liked the area but the Prêfet, Maurice Grimaud? didn't think a private developer could preserve the public interest. In the summer of 1959 planning started under the auspices of Laurent Chappis, the chief architect at Courchevel who had recently split with Michaud over the commercial direction that station was taking. It was necessary to convince the community of Arâches, a deal was done as long as Flaine bought the loss making Carroz cable car. On the 1st of September 1959, Bossoinnas created the SEMAG, the Societe d'etudes pour l'amenagement du massif entre l'Arve et la Giffre. This mouthful was shortened to the SAG in 1962 (Societe d'amenagement Arve-Giffre). This was a new kind of organisation designed to bring together private investors and the state in development projects. The SAG initially was divided between the Department: 20%, Arâches: 16%, Magland: 12%, Samoëns: 4% and the Boissonnas: 48%. The department agreed to contribute 2 million Francs towards the construction of a road. Boissonnas had the right to develop 60% of the building land and had a concession of 90 years on the ski lifts (30 years was the norm at the time) but had to make up the deficit for the building of the road which ended up costing 8 million Francs. The former land owners also were given some concessions, they could buy back some of their land to build as long as they respected the overall plan. None of them took this option, they preferred to sell out to the promoter. The agreement was slightly revised in 1965 with Éric Boissonnas given the right to develop 90% of the land, due to the lack of an alternative developer. Impressed by the American modernist school of architecture that seemed capable of blending old and new, Eric Boissonnas turned to Marcel Breuer to give an original look to the station. Breuer had been a founder member of the Bauhaus school and has been described as the last modernist. Bringing in an outsider didn't sit well with the existing team and both Chappis, and Denys Pradelle? who had also joined from the original Courchevel team quit. Éric Boissonnas saw the construction of Flaine as a cultural adventure. Breuer was charged with creating an open air museum. 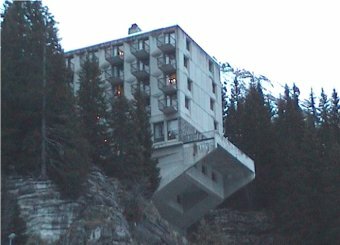 In that he succeeded, the resort of Flaine is now a listed monument. The planning team wrote in 1961 that the development "should be an example... and should treat everyone involved fairly, including the developers". Fine words that didn't always reflect the reality on the ground. To build the 15km of road, in particular the 5km Carroz section, it was necessary to cross private land. When friendly negotiations broke down, the Mayor, who was in charge of this section, had to result to compulsory purchase. The price was fixed at a few centimes m^2^, this caused a revolution when it became known that the Boissonnas were rich to the tune of billions of Francs. In 1964 the landowners formed a defence group. They found some errors in procedure and threatened to block the building of the station unless the developer could be more generous. Eric Boissonnas was not opposed to this, the extra costs were a drop in the ocean compared to the 8 million to build the road but it was not his decision. Unwilling to set a precedent, 3 years of delay ensued before the state gave the go-ahead, two hundred thousand Francs of extra costs. This delay was more important to Eric Boissonnas, he had to pay for alternative transport. The builders (Boussiron) found that the rock was friable and there was a lack of water on the site. 40 million Francs had to be spent without a single bed or ski lift being put into service. In July 1964, worked stopped. Eric Boissonnas was talking to Rothschild with the aim of selling up. Until that time the state and Michaud had been content to watch the brothers fritter money away but a potential bankruptcy would bring others down too. A further 1000 beds were authorised and a public loan made available for the ski lifts. The Boissonnas were not the only ones to fly close to the sun. The problems with the acquisition of land left a bad taste with the locals, it took the intervention of the local Bishop to get the local Socialist candidate, Briffod re-elected. The same trick didn't work for Moret, the Mayor of Arâches, who was beaten by candidates from the land owners group. This politicising of the original landowners was something future developers, particularly at la Plagne and les Arcs would be aware of. Marcel Breuer worked with pre-cast concrete and rejected the regional Savoyard styles. The result is a modern, some would say brutalist, architecture that never-the-less integrates well with the site. The lines and colours of buildings harmonise with surrounding mountains. These are interspersed with sculptures by Jean Dubuffet, Véra Cardot, Pablo Picasso and Victor Vasarely. The pistes were laid out by Emile Allais and benefited from the start with a modern lift installation. Flaine had the first high-speed 8 seater chair lifts in France and the first artificial snow making. The skiing has been developed around the idea of secure off-piste. Many of the harder runs are never pisted and there the Gers and Veret bowls are watched over by the pisteurs. The author, Bob Gatje, spent twenty-three years working with Breuer and gives readers an insider's perspective on the architect's design methods, practice, professional life, and most noted works. From UNESCO's Paris headquarters and the New York's Whitney Museum to the ski town of Flaine, Marcel Breuer's buildings are strongly tied to idioms of modern architecture pure forms of geometry, interlocking flat-roofed cubes and to the architectonic attributes of painting and sculpture of the modern movement Beginning as a furniture designer at the Bauhaus (Breuer's chair designs are still sold today), Breuer widened his sights to include architecture in the 1920s and by mid-career was lauded for his buildings. Near the end of his 50-year career and since his death in 1981, opinions have been divided and critics tend to look down on his architecture while celebrating his furniture design. The author Isabelle Hyman makes the case for Breuer's eminence strictly as an architect.